Five students in the Research & Development Team of the Science & Mathematics Society at SMK I.J. Convent Johor Baru, has done the nation and Johor proud for their invention of an Infinity Spoon. The Convent Johor Baru team, comprising Alicia Dixon, Kok Jie Yi, M. Krisharani, Christine Ling and Janarnii Ramesh Kumar, was among four teams that represented Malaysia at the prestigious Euroinvent 2017, an international science competition held in Romania early this year. Their invention of the eco-friendly Infinity Spoon clinched the Euroinvent 2017, Diploma of Gold Medal and was also awarded an Honor of Invention by the World Invention Intellectual Property Association (WIIPA). During the prize-giving ceremony, the team was pleasantly surprised to receive a special recognition for scientific creativity and originality by the Romanian Association of Alternative Technologies ARTA Sibiu. This unexpected bonus was a wonderful surprise that simply thrilled and encouraged the young inventors. When I saw their photos on social media, I felt a surge of pride not only because I’m a Convent JB alumnus but also because I believe this invention was the start of something BIG. Recently I met the winning team with their teachers and mentors and learned more about their exciting journey to such an amazing achievement. Head of Physics Department, Farrah Zainol, who taught Physics, Science and Mathematics to Form Four classes, talked about how she would get students involved in their class projects to fire up their interest in Science and Physics. After she had laid the foundation for a passion in Physics, these students who moved into Form Five classes, would then be guided by Geetha Nair, who would prepare them for exams. In a brainstorming session, the teachers and the R & D Team finally agreed on creating an Infinity Spoon using four types of flour. But why did they choose to create a spoon? When the team gave serious thought to inventing a product that will combat two major problems in the community - plastic pollution and agricultural waste - they observed how plastic spoons were widely used and discarded. This prompted the idea of an eco-friendly Infinity Spoon. Supervised by Farrah and mentored by Aziemah Zaini, the team worked on creating a biodegradable spoon from various types of flour and the prototype from this research project was presented at the Asian Young Inventors Awards and Expo 2017 last February. A team of 10 Form Five and Form Four students who participated in this international event held at the Putra World Trade Centre, Kuala Lumpur, received two Silver awards. While this outcome was encouraging, Farrah still pondered upon the judge’s comments: “… to add something – use waste and turn it into wealth…” and she wondered what kind of waste Johor has in excess that could be turned into wealth. Farrah, who furthered her studies in the UK, remembered how she used to long for a taste of juicy Johor pineapples and how expensive it was to buy them there. Each time she enjoyed fresh pineapple, she felt sorry to throw away such a large part of the fruit. This memory inspired her to consider how pineapple peel – a fruit waste and biodegradable substance – could be recycled into material and blended with their flour formula to create a more robust Infinity Spoon! When Farrah shared her ideas with the R & D Team, they researched and experimented with pineapple peel. 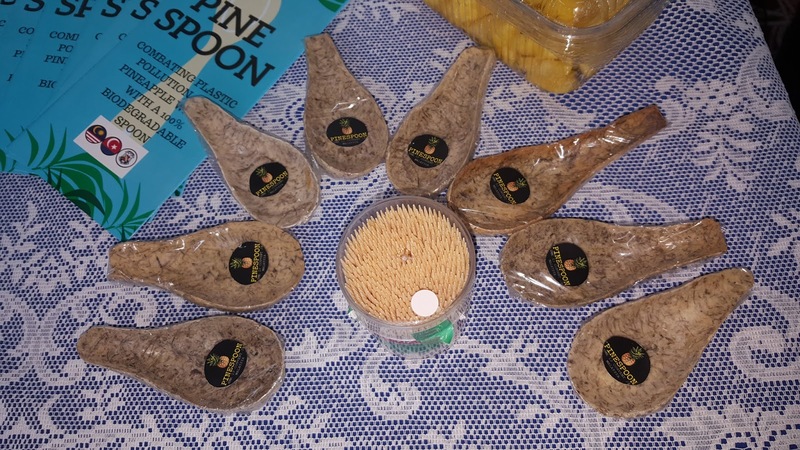 Janarnii recalled that for about three months, the team researched methods to extract and implement the pineapple fibers, and tested the durability, eco-friendliness and shelf-life of their spoon, with encouraging results. To gain more information about pineapples and how pineapple waste was being used, they visited a pineapple farm in Pekan Nanas and the institute for pineapple research. “Our state is a leading producer of pineapple and while pineapple waste is used in many fields, it has never been used for cutlery,” said Kok about the inspiration to use Johor pineapple for their first pineapple-based cutlery which is both edible and eco-friendly. They soon discovered how the fiber from the pineapple crown was the strongest and most suited for their Infinity Spoon so their invention was aptly named, the Pinespoon. Farrah felt that the time was ripe for their invention to be presented at Euroinvent 2017, a 3-day competition in May, and believed that the exposure would boost the morale of the team who had worked tirelessly on this project. “We had no money but we had moral support,” said Farrah as she described the challenges they faced and with the support of the school administration, in particular former principal, Tay Suat Gan, and students’ parents, the team went to the city of Lasi in Romania. “Presenting our Infinity Spoon at an international platform like Euroinvent was a major step in promoting our product,” said Ling who shares her team’s desire to see their Pinespoon becoming commercially viable with the help of investors to partner them in developing and marketing this product. Krisharani agreed that their spoon needs aesthetic improvement and with a proper mould, it should be more marketable and its shape, more user-friendly. “All our hard work and sacrifices for this project was worthwhile because we proudly brought honour to our team, our families, our school and even our state and nation!” said Dixon who succinctly summed up their feelings about the recognition they received. Established in 1927 with a tradition for excellence, Convent JB has earned a prestigious reputation as a High-Performance School for achievements in education and co-curricular activities, and has produced countless successful professionals who are contributing positively to society. The recognition for the R & D Team’s invention is yet another accolade for the school but I believe, this is only the beginning. With the investors’ partnership, this uniquely Johor Pinespoon may someday replace plastic spoons and make a huge environmental impact worldwide as people use this eco-friendly spoon everywhere!